Apple sets earnings records! Doesn't manage to please the markets! In contrast to Nokia, Apple are riding high! They have one of, if not the most popular smartphone range on the planet and for yet another quarter they posted stellar results! The guys from Cupertino managed to rake in a total of $54.5 billion worth of revenue, which gave them a profit of $13.1 billion, a new company record! If you're a shareholder then you're probably going to be quite pleased with a return of $13.81 per share! This announcement compares very similarly with the same period last year where the company totted up $46.3 billion worth of revenue and manage the same in terms of profits, $13.1 billion. 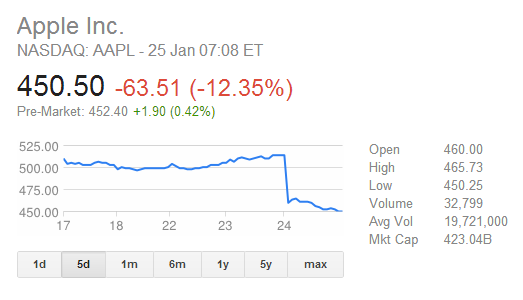 Profit remained the same because Apple's gross margin fell to 38.6% from 44.7% last year. Some people have attributed this to the sale of lower priced items like the iPad Mini and higher sales of the iPhone 4 and 4S, both of which are still selling very well! In terms of the actual numbers of sales, Apple pushed out 47.8 million units of the iPhone last quarter, again a new record for the company and was an increase from the 37 million sold in the same period the year before! iPads did equally well, selling 22.9 million compared to 15.4 million in the same time frame the year before, this was also a new record! Despite this seemingly good news the markets were not impressed! Apple missed the earnings forecasts from Wall Street for the third consecutive quarter and iPhone sales actually came in below expectations! 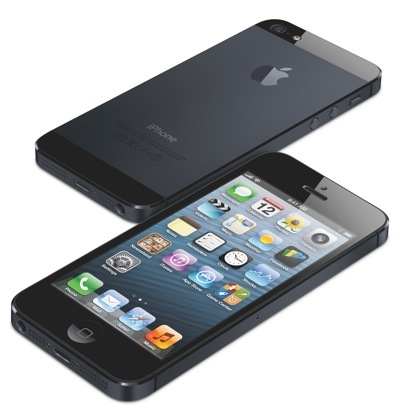 This seemingly made some people apprehensive about Apple's dominance of the smartphone market! 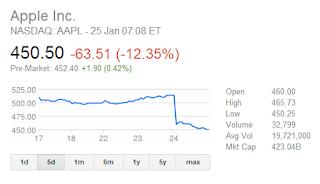 You can see exactly what happened on the stock market on the image to the right! This dropped wiped $50billion off the value of the company! For the coming quarter Apple is reportedly aiming for revenue in the region of $41 billion to $43 billion and a gross margin between 37.5% and 38.5%!